We were hit from behind while stopped at a red light at an intersection today. My back hurts more than it did last time I was in an accident. I’m not sure if it was that we were hit when we were not moving or if it was that it was totally unexpected so I had no time to brace myself for it. I won’t know the damage until tomorrow, or later this week. That seems to be the way these things go, but I’ll definitely be seeing a doctor this time. After the accident I went downtown to Granville Island. It took nearly two and a half hours because buses were running on holiday schedules. I got there late and couldn’t find the people I was supposed to meet up with. I waited outside the restaurant for a while in case maybe they were later than me, but I was getting shaky and sugar-low so I went to go find something to eat. I’m willing to bet that aside from buskers and people working, I was the only person there that was alone. Today was such a gorgeous day to be out with your friends/family/significant other. But for once, that didn’t really matter. I got some dinner from the market and sat outside to watch kids chase the pigeons around and it was pleasant. Normally sitting in one place for any given time in public would cause me to have an anxiety attack but today I enjoyed it. Something’s shifting for me. I think I’ve finally reached the point where I just have to go do things myself otherwise they won’t get done. And you know something? I’m okay with that. I wandered over to Maiwa Supply finally. I’d heard there was yarn there before, but I wasn’t sure what exactly I was expecting. There was a lot of yarn and fibre to fondle, dyes and some bolts of cloth. I considered breifly getting something that I could sneak into the house without anyone knowing, but I realized that the only thing I could really justify getting right now – something I need – was two skeins of Cascade Eco wool to make OWLS. Somehow in looking at pictures online I lost touch with the actual physical reality of this. I was surprised by how big the skeins were, though I don’t know why, because if two will make a sweater then you’d think they’d be kind of large. I didn’t get anything, finally. I need to use up some of the stuff that I already have first. The original ad had said that it was a ten minute walk from the skytrain so we decided to test it out. Thirty minutes later we arrived. Not bad, and not totally unexpected. The place was kind of cavernous. It had long, narrow dark hallways with random bedrooms that opened into random places and a few weird little rooms that could only be accessed through other bedrooms. Apparently there was someone in there when we arrived. The person moved silently throughout the rooms ahead of us. It reminded me of the uncomfortable feeling I got when my dad and I went to a house that was a foreclosure sale, where all the inhabitants were there to glare at you as you walked through. I didn’t get to see the dining room because the person was in there – it had been converted into a bedroom by the current tenants, the evictees. I could see why they were leaving. The place smelled off and flies were everywhere. They’re going to clean. We move in September first. I picked a good week to restart my blog. I’ve got a major paper due on Friday, full time work during the day, an internship that I have a bunch of stuff to do for and on Tuesday a couple of friends told me they were looking for a roommate for a house they’re renting. I thought it over and decided that what the hell, I’ll go for it. It’s a much more convenient location that’s not in my parents’ living room with people I get along with pretty well. I will be half an hour away from school, half an hour from work and heaven forbid I may have a social life again. The worst possible thing that could happen would be that we’d get on eachothers’ nerves and I’d go crawling back to my parents. We’ll see. I’ve got so many things going on right now it’s hard to keep track. I remember as a kid going to the fair at the PNE and looking at all of the crafts and thinking that I wanted to enter some stuff. I’d take the prize book home and start highlighting everything I could possibly think of to enter, but followthrough has never been one of my strong points. It wasn’t until I moved out to Maple Ridge that I actually made a point of writing down the entry dates. In spite of that, I botched my entry but they took it anyways and I won two ribbons. And, well, the rest is history. 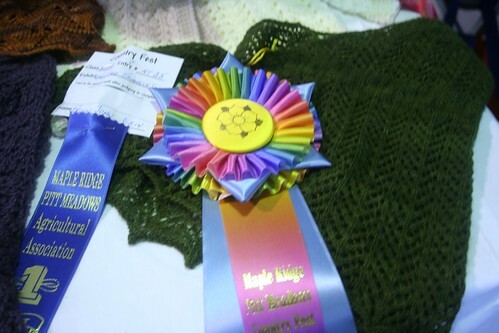 This year I got 12 ribbons and the best in show rosette you see above. The green scarf won a special prize. The good news is that it is being sent to the provincial fair in Vernon. The bad news is that they’re holding it until that fair so I won’t get it back until mid-late October. The fair’s not about the ribbons though. 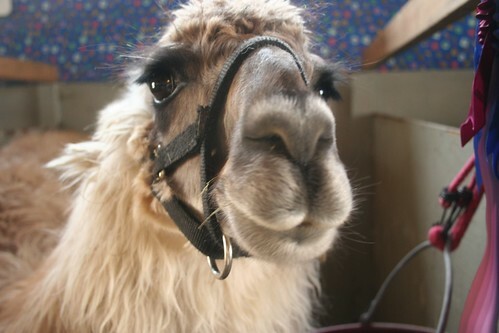 It’s about seeing the llamas. I used to be so compulsive about blogging every day. It’s a habit, more than anything. People ask how you come up with something on a daily basis and I don’t really have an answer to that. I think if you do it enough it just happens. Stuff comes to you. It becomes the way you structure the things you see. It’s like how when you have a camera everything becomes a shot, and hammers only see nails. As a blogger you begin to see posts everywhere. Once you get out of blogging daily it’s really hard to get back into it. Switching over to this site was only supposed to take a day, maybe a week. Instead it’s been the better part of two motivationless months. I needed the time off though. I needed to think some things out and I needed to put my old blog to rest. I’ve outgrown it, a surprising number of people I know were reading it and like everything else, it pretty much went to hell in a handcart in 2008, taking my readers with it. Everyone needs a change sometimes. I’ve come to the realization that some of the motivation I need is readers, but that I won’t have readers unless I post something. My name is Erin. I grew up in a park. I have two cats and a hive of bees. I'm studying communication and sustainable community development in Vancouver, BC. I'm good at many things, but highly incapable of describing myself. My local newspaper called me a Fellini once. Perhaps that helps? None of the opinions expressed on this here blog belong to my school, employers or organizations I'm affiliated with. All photos are my own, unless otherwise noted. This work is licensed under a Creative Commons Attribution-Noncommercial-Share Alike 2.5 Canada License. If you want to use something that you see here, please ask.